The snow is falling! Nothing looks more beautiful than a blanket of fresh snow on the lawn. No doubt, all of the white fluff will beckon to children to gather their coats and mittens and come and play. Children love the snow, and the chance it gives them to frolic and play. So this winter, take your arts and crafts time outside, using the fresh snow as your canvas. With just a few simple and inexpensive supplies, you can create colorful and lively masterpieces in the snow with this fun snowy spray art activity for kids. This is an excellent project to try once that winter boredom sets in, or if you are tired of making the same old snowmen! Take a peek at this easy to do winter art activity! Fill each bottle with cold water. Add a few drops of food coloring to each bottle and mix well until you get the color you wish. Mix colors to create a variety of hues. Tighten the spray lids on the bottles and shake well to make sure they are thoroughly mixed. Now the fun part, head outside! Now comes the easy part! Once your bottles of colored water are mixed and ready, head out to the snow and start spraying away! The snow will act as a blank canvas and the water will create a beautiful variety of colors and designs right in the snow. Switch between the “spray” or “stream” option on your bottle to create different effects. Is their masterpiece complete? Just move to fresh snow or stir and repack already painted snow when you are ready to create a new design! Use a food safe food coloring, so your art work will wash away clean with the next snowfall or drizzle. It will also wash clean from hands or any clothing it may come in contact with! This activity is a fun way to add a pop of color to an otherwise cloudy and boring winter day. 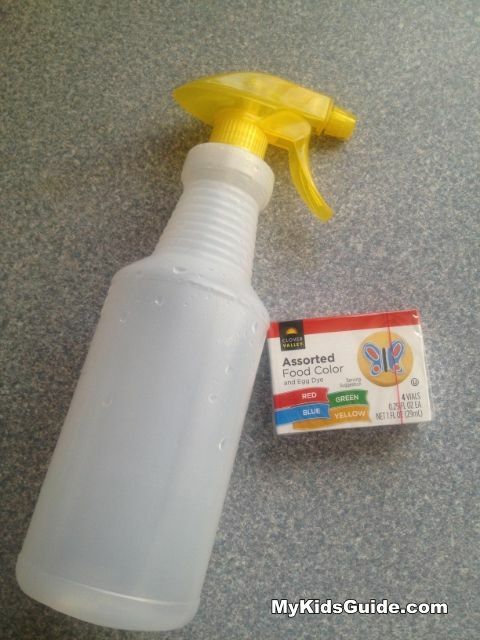 The shorter and fatter spray bottles found at most dollar stores are best for smaller hands. These are about four to six inches tall as opposed to eight to ten inches tall. Don’t feel the need to buy multiple bottles of food coloring. All you need is red, yellow, and blue, which you can then mix and create a whole spectrum of other colors. 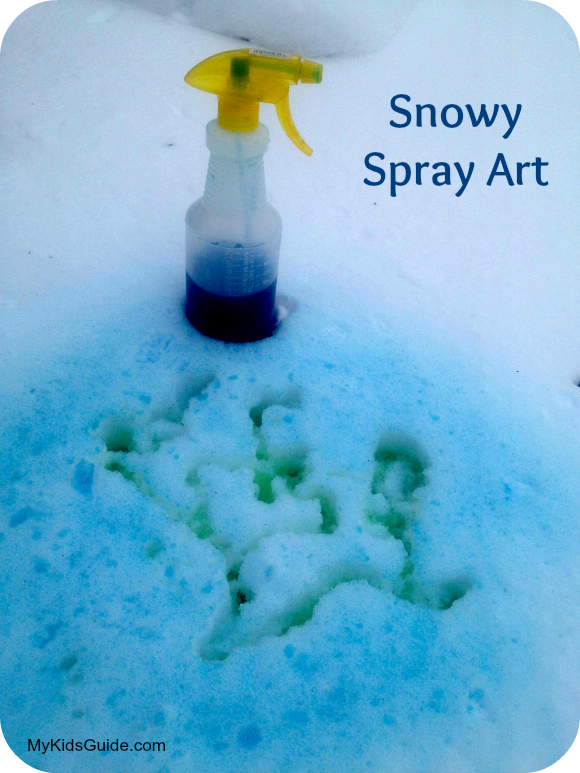 Try building snow sculptures and “paint” them with your spray bottles. Talk to your kiddos about the colors mixing. This is an excellent activity to continue to develop fine motor skills and to talk about colors, liquids and solids! So round up these few simple ingredients and head outside! A blank canvas is waiting for you right in your own yard and children will no doubt enjoy the chance to fancy it all up with lots of color and their own personal designs! Just remember to take lots of pictures of your child’s snowy spray art creations, since they’ll be gone when the snow melts! Be sure to check out our other fun winter activities for kids to keep the excitement going all season long! What a smart and fun activity to do with the kids!!! That looks like a lot of fun, and we definitely get enough snow here to try! It’s really a fun project, you have shared an interesting DIY Snowy Spray Art, i want to say thanks for sharing this great idea. I hope other follower will also like your idea. I have done this. So fun!